Deep breathing, a long stretch and a well-earned “namaste” can do wonders for a person’s mental outlook. 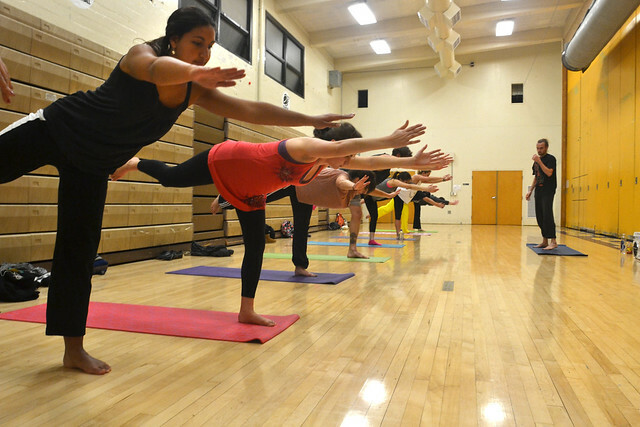 With finals looming, some SF State students have found a way to relieve stress and body tension with Campus Recreation Group X yoga classes, which enables them to concentrate on their studies. Although yoga offers a wide range of benefits — such as becoming more connected to one’s body and mind through movement, breathing and stretching, according to Group X yoga instructor Meredith Olson — one of its more noticeable benefits is shown through relaxation. Senior Amina Semmoud, who has practiced yoga off and on for seven years, said feeling relaxed afterward helps her concentrate on her homework later on in the day. “College is really stressful so it’s nice to be able to do yoga and just relax,” the physiology major said. By practicing yoga, Student Health Services nurse practitioner Linda Meier said students can not only relieve stress while concentrating on balancing in positions, but also find ways to breathe more deeply, which is a major contributor in being able to calm down. Other students, including jazz piano major Mali Carter, find yoga improves their musical abilities. Carter has only been doing yoga for a few weeks and plans to continue practicing during winter break. “Well it helps me to stay relaxed and it strengthens certain muscles that I use when playing piano, such as my triceps, my biceps, my back muscles and my abdomen,” Carter, 30, said. The practice has grown in popularity among students of all ages, including 21-year-old Rachel Critelli, who found her love for yoga after she started taking University classes three years ago. Olsen, who has taught the class for the past three semesters, emphasized that yoga is for anybody — male or female. Jeff Cope, two-year yoga instructor at SF State, said he had those stereotypes as a man before taking his first yoga class five years ago after an injury. Cope said stereotypes about yoga practitioners should be dismissed. Critelli said yoga is addictive because of the state of mind yoga puts her in.